This book presents the latest evidence-based approaches to assessing and managing movement disorders in children. Uniquely, the authors have chosen to examine not just children with developmental coordination disorder, but also children with movement difficulties as a co-occurring secondary characteristic of another development disorder, including Attention Deficit/Hyperactivity Disorder, Autism Spectrum Disorder, Specific language Impairment and Dyslexia. 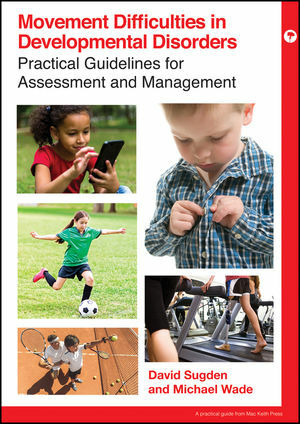 Guidelines are underpinned by motor learning theory, empiricism and professional practice. The authors have taken an ecological approach to management and show how professionals and carers working together can make relatively simple changes in a child's life that aggregate to substantial support. The book is rich in case studies to demonstrate the adaptability of these guidelines and show how they may be applied to children of different ages, abilities, and environments. The final chapter is comprised of interviews of thirteen notable clinicians and academics with intervention methodologies from around the world. This book will prove a valuable guide for anybody working with children with movement difficulties, including clinicians, teachers and parents. David A Sugden is Emeritus Professorin the School of Education at the University of Leeds, UK. His academic background is in developmental psychology, special education and physical education. His specialist research interests include motor development, motor impairment, motor learning, and children with developmental disorders. His work centres on the characteristics of typically developing children and those with various forms of impairment. He is co-author of the most widely used assessment instrument for motor difficulties, the Movement Assessment Battery for Children. His publications range from pure research to professional practice. He reviews for government research councils, in UK, USA, Canada, Australia, Hong Kong and Singapore and for many journals. He has successfully supervised over 40 PhD students. Michael G Wade is currently Professor in the School of Kinesiology University of Minnesota Twin Cities, USA. Professor Wade’s research interests focus on human movement in general and more specifically on the coordination and control of skill in normal and abnormal human movement across the lifespan. His published research addresses atypical children with both intellectual disabilities and those with dyspraxia. He has published continuously from 1968 to the present, including over 100 journal articles, book chapters, and books, both edited and authored. Dr Wade is a Fellow of the American Academy of Kinesiology and is a Past President of the North American Society for the Psychology of Sport and Physical Activity.